There’s only one time when you can depend on the chronically backlogged, recklessly inefficient Department of Homeland Security to perform smoothly: election season. While hundreds of thousands of visa overstayers and deportation fugitives remain on the loose, federal bureaucrats at the U.S. Citizenship and Immigration Services (USCIS) are hastily recruiting tens of thousands of foreigners for the Obama administration’s new “U.S. citizenship and immigrant civic integration” campaign. For the past week, the agency has staged more than 200 naturalization ceremonies for more than 36,000 new citizens. In partnership with the Interior Department (the same one that blocked American veterans from visiting war memorials during the 2013 federal government standoff over spending), the feds hosted camera-ready events at national parks — and encouraged their new political pawns to post propaganda photos across social media. Local law enforcement agencies have a hell of a time getting hold of federal agents to help screen and detain criminal aliens. Fingerprint databases spread across DHS, the State Department and the Justice Department still don’t talk to each other. There’s still no comprehensive database to track the exits and entries of temporary visa holders — let alone any functional system to kick out overstayers and keep them out. Wait, that’s not all. The same government that wasted billions of dollars on the botched federal Obamacare website for Americans has helpfully set up “new interactive practice civics tests” to help their new future voters secure a permanent Democratic ruling majority. The election-year naturalizers will have the test ready “in English … with other languages to follow” soon. Make no mistake: Cultural assimilation into American life isn’t their goal. Political exploitation is. Did you know that the Obama White House released $10 million in taxpayer money to 40 of its favorite left-wing groups in 26 states to facilitate the expedient citizenship drive? The amnesty-championing Asian Americans Advancing Justice is just one of the social justice recipients involved in pushing green card holders to naturalize — not to show their patriotism, but to march in partisan lockstep so that “political candidates will no longer be able to ignore this growing political force.” ACORN lives. How carefully will the Obama DHS conduct its background checks of citizenship applicants before the election? If history is any guide, we already know the answer: as carefully as the EPA protects rivers in Colorado! Remember: In the 1990s, the Clinton administration first turned immigration policy into a massive Democratic voter recruitment machine through the Citizenship USA program. Naturalization officers simply abandoned background checks wholesale. Former House Judiciary Committee chief counsel David Schippers recounted how a “blatant politicization” of the then-INS took place during the 1996 presidential campaign, during which the White House pressured the agency into expediting citizenship to thousands of aliens whom the White House counted as likely Democratic voters. In 2003, an Immigration and Naturalization Services center in Laguna Niguel, Calif., solved massive backlog problems by putting tens of thousands of applications through a shredder. In 2006, I exposed how some high-immigrant regions rewarded adjudication officers with bonuses for rubber-stamping as many applications as possible without regard to security. 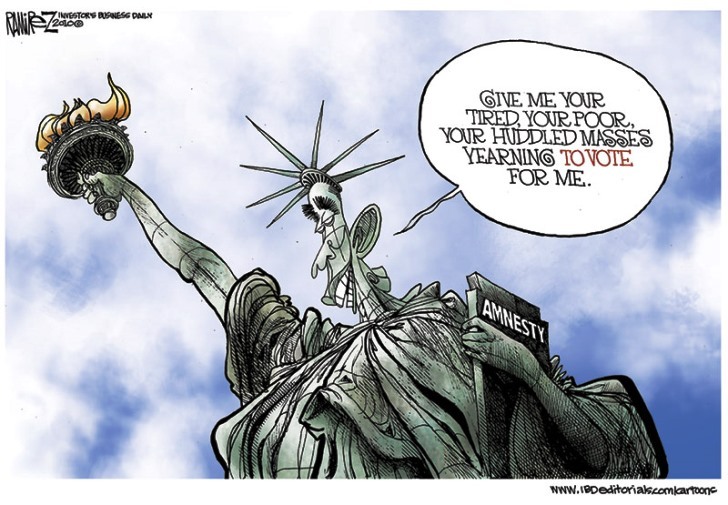 And under President Obama, a whistleblower told Judicial Watch how the administration had abandoned required background checks in 2012, instead adopting “lean and lite” procedures to try to keep up with the flood of amnesty applications spurred by Obama’s Deferred Action for Childhood Arrivals (DACA) directive, which grants illegal aliens a two-year deferment from deportation. The dysfunctional DHS can’t control our borders. It has failed to prevent massive fraud in our asylum, student visa, visitor visa, business visa, tech worker visa and immigrant investor green card programs. And the department is overwhelmed with paperwork from 10 million applicants for Obama’s executive amnesty waivers. But when it comes to signing up new potential Democratic voters in droves, the feckless feds run a NASCAR-ready well-oiled machine. Suicidal Republicans who continue to hand over the open-borders keys to their hit-and-run opponents reap what they sow. Michelle Malkin is author of the new book “Who Built That: Awe-Inspiring Stories of American Tinkerpreneurs.” Her e-mail address is malkinblog@gmail.com.